In one of our cutest DIYs yet, make your Mother's Day gift wrapping really stand out with a Dip Dyed Tassel! Step 1. 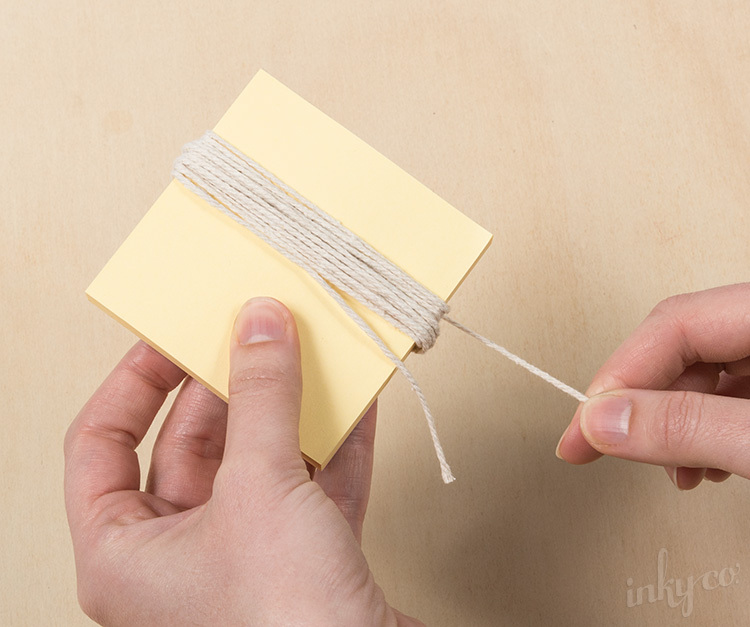 Begin by placing your twine length ways on the note pad leaving a 'tail' hanging down the bottom. Step 2. 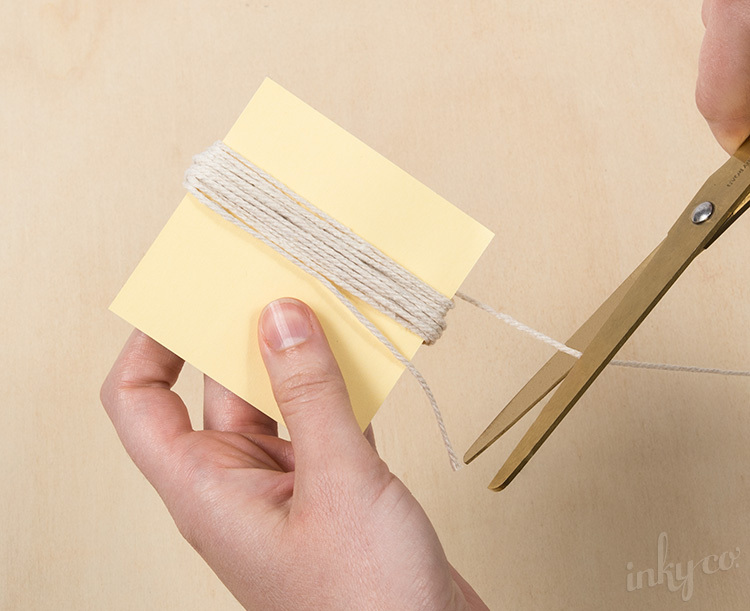 Wind your twine around the note pad approximately 15 times. You can increase or decrease this number depending on how thick you want your tassel to be. Step 3. Cut the twine away from the spool at the bottom, leaving another 'tail' of twine. Step 4. 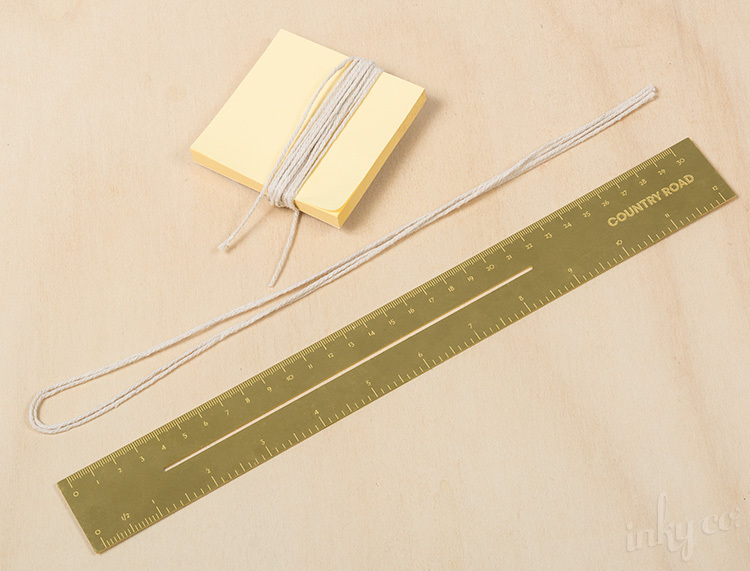 Cut two lengths of twine to approximately 60cm in length. Step 5. 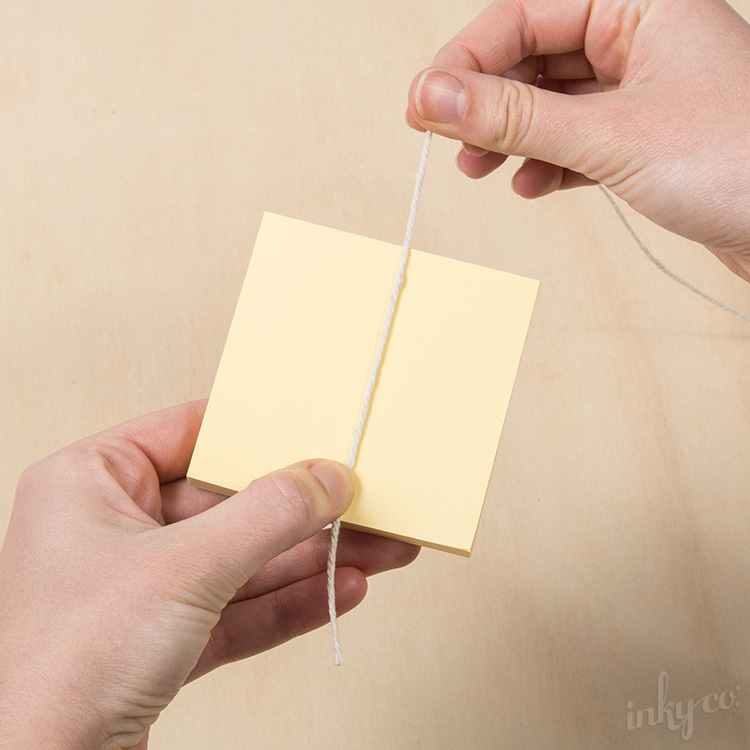 Gently remove your looped twine from the note pad ensuring that it stays in formation. 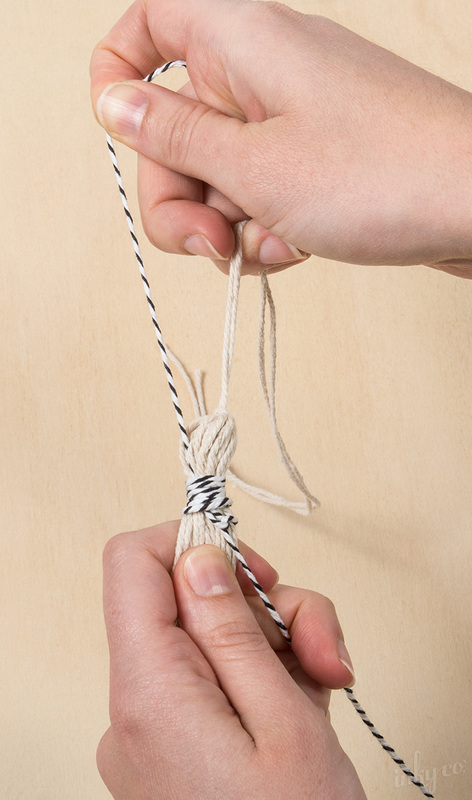 Fold one of your 60cm lengths of twine in half and loop in through the top of your twine and pull tight to secure in place. 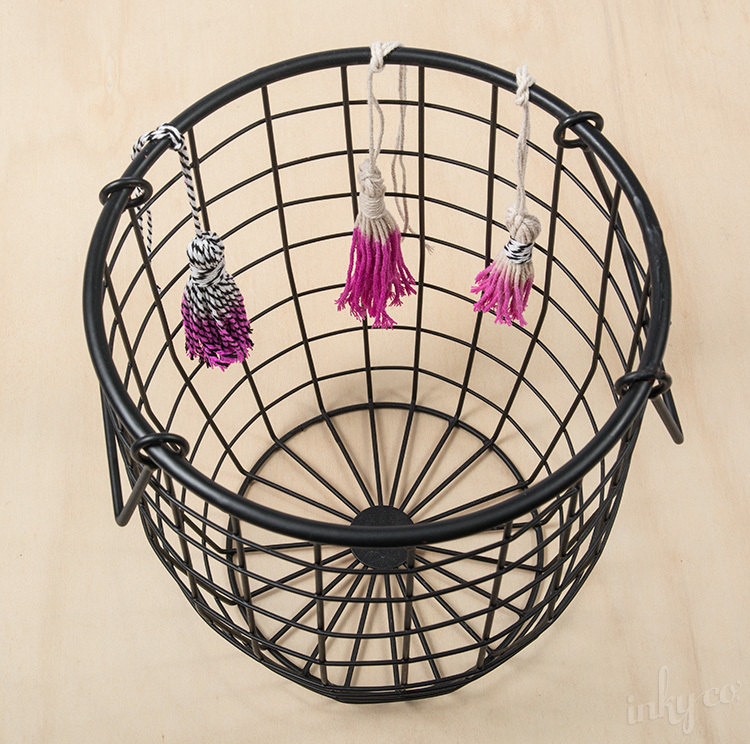 This will be used to hang your tassel. Step 6. 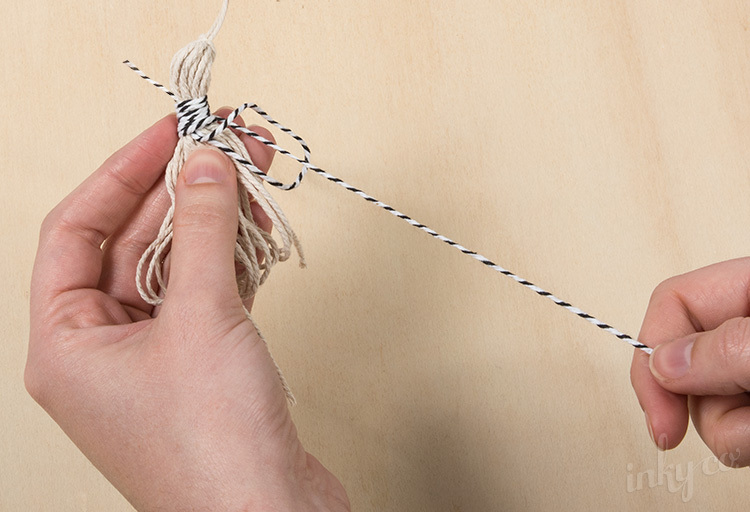 Using your second 60cm length of twine, create a loop like shown in the image above with a 'tail' at the top and a 'loop' at the bottom. NOTE: We have used a contrasting colour twine in this picture to help show you how the next part works. Step 7. Holding your looped piece in place against the top of the bunch of twine, wind the long end of the twine around the top of tassel over the new loop. Ensure that you keep the 'tail' and 'loop' free at the top and bottom. Continue winding your twine around until you have been around 6-7 times, keeping the lines tight together and stacked on top of each other. Step 8. 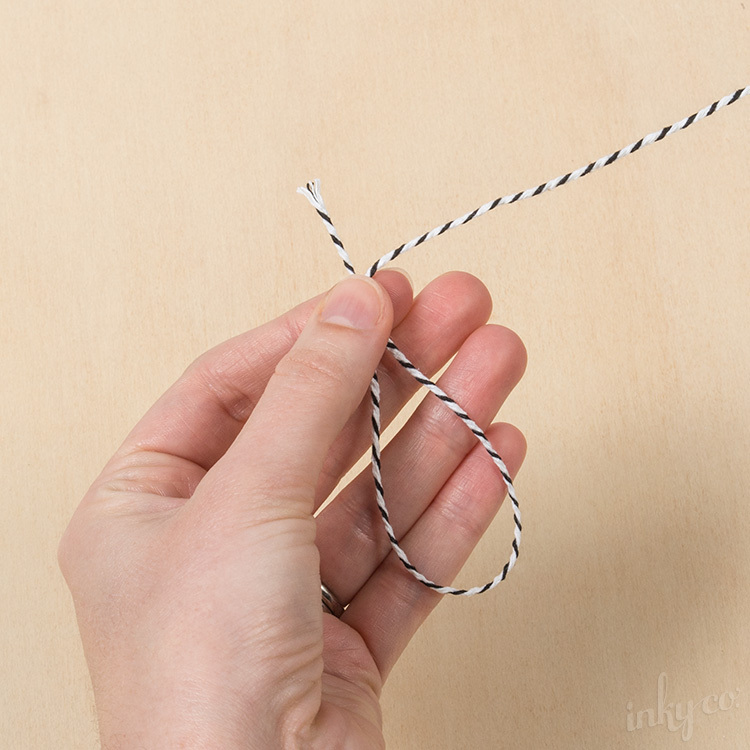 Once you are done winding, thread the end of the twine through the bottom 'loop'. Step 9. 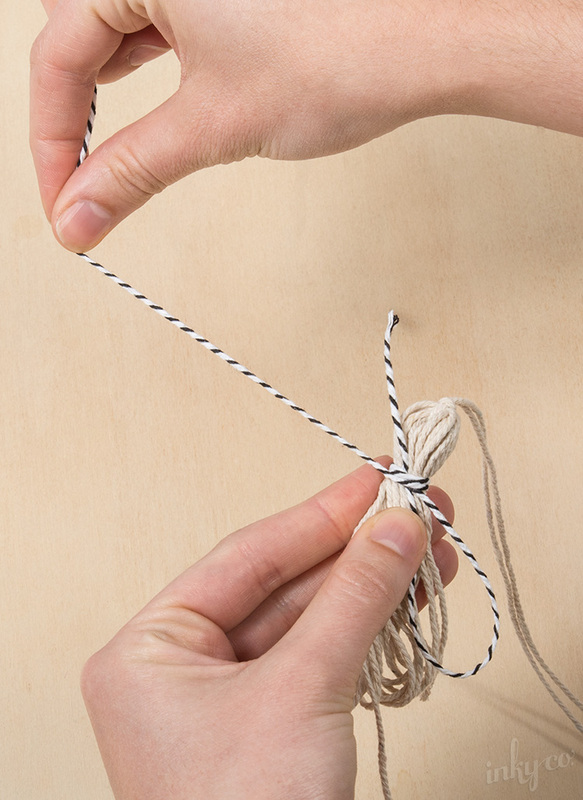 Pull the top 'tail' upwards until the bottom 'loop' pulls the end of the string under the wrapped section. Step 10. Trim the top piece close to the wound section. You can also trim the bottom if you have chosen a contrasting twine colour. Carefully tuck any loose pieces under the wound section. Step 11. Trim the tassel ends. Step 12. 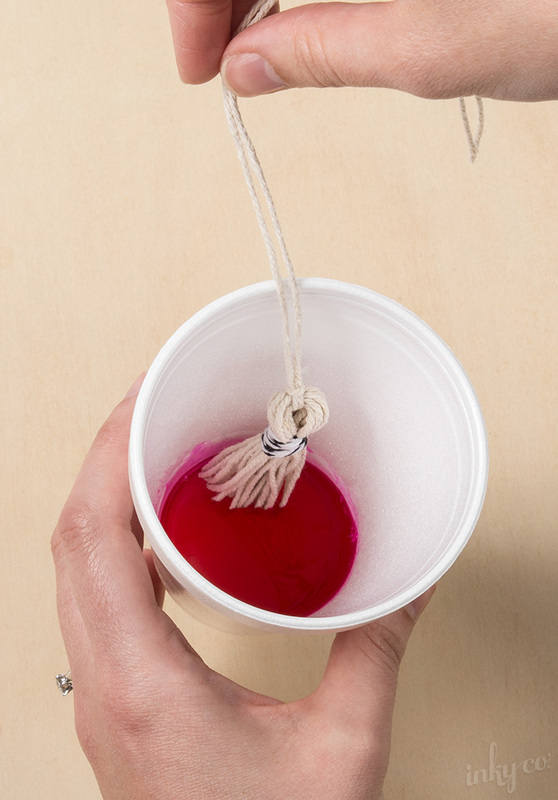 Pour a small amount of your ink or dye into a disposable cup. If you are using a water-based ink you can dilute it with water. Step 13. 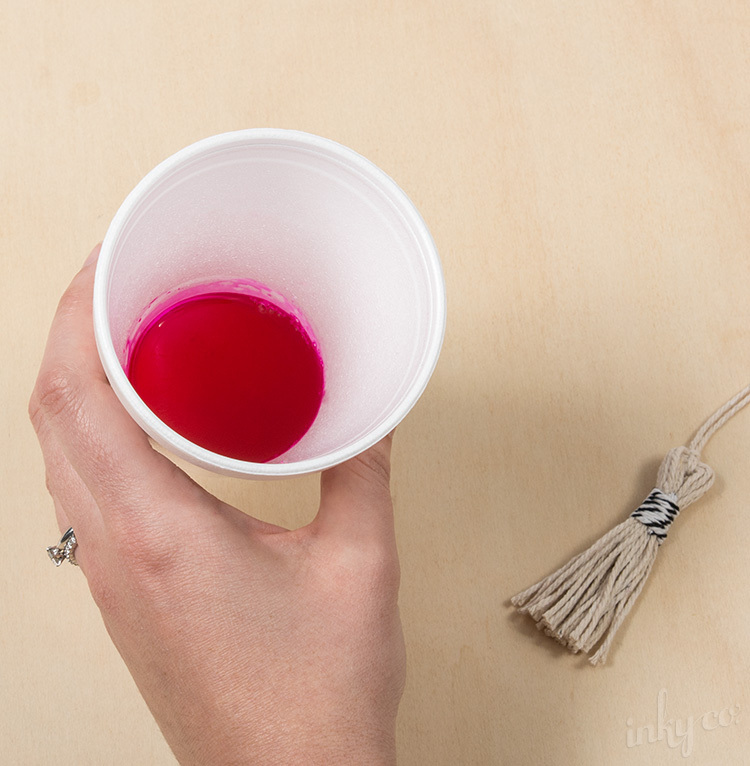 Holding your tassel at the top, gently dip your tassel ends into the ink. 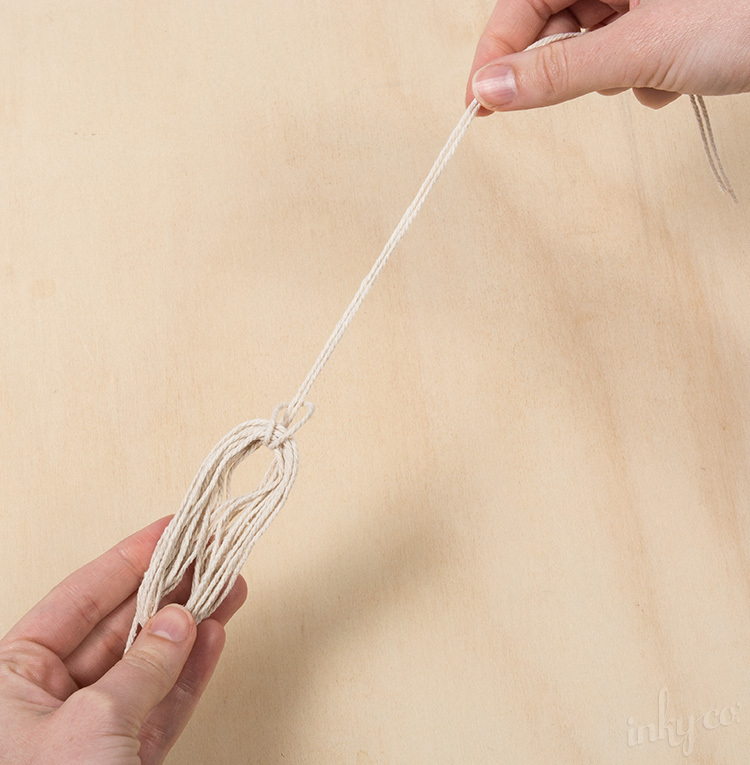 Swish the tassel around to help cover each strand of the twine. Dry them off using paper towel to stop them dripping while they dry. Step 14. Once you have the desired colour, remove your tassel and hang it up to dry. We used a wire basket to create a hanging frame. Step 15. 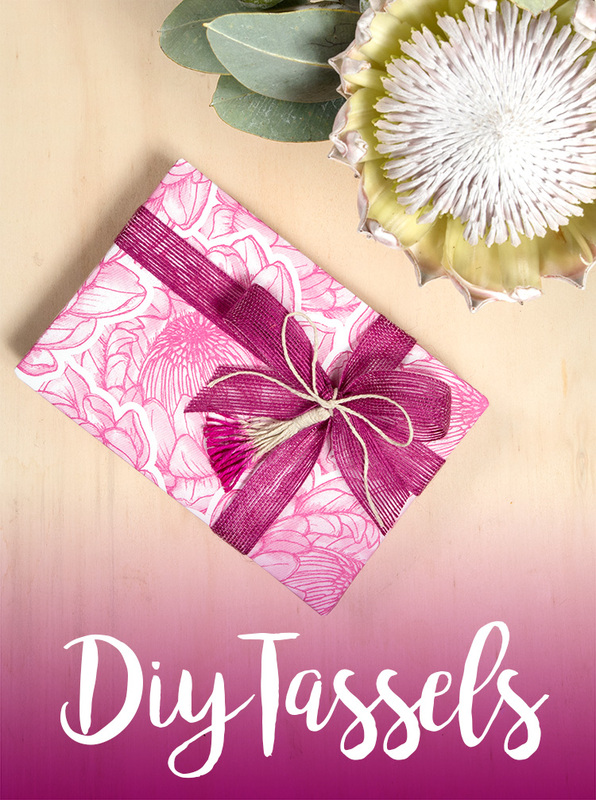 Wrap your gift as usual and once your tassels are dry, attach them to your gift! 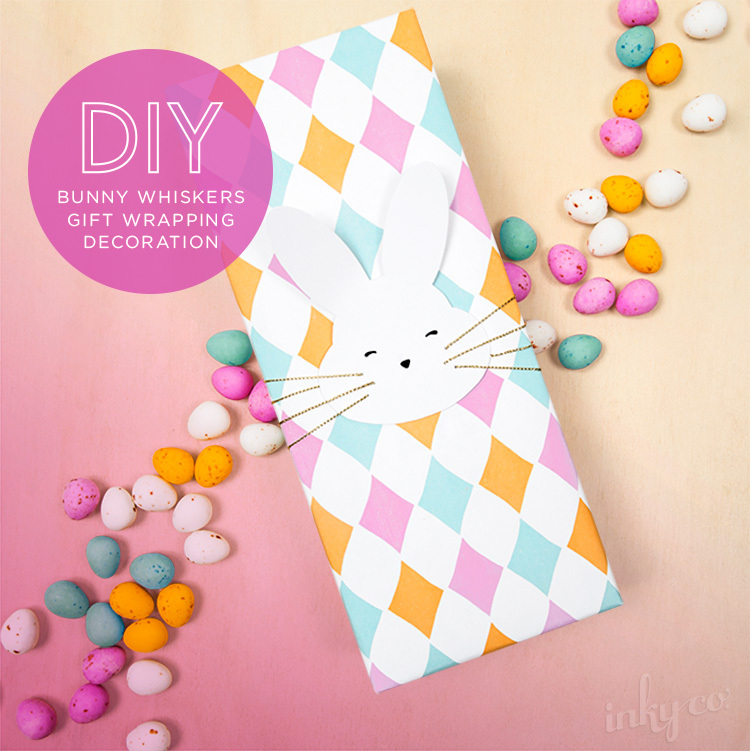 This easy and quick Bunny Whiskers DIY is guaranteed to add all the cuteness to your gift wrapping this Easter. 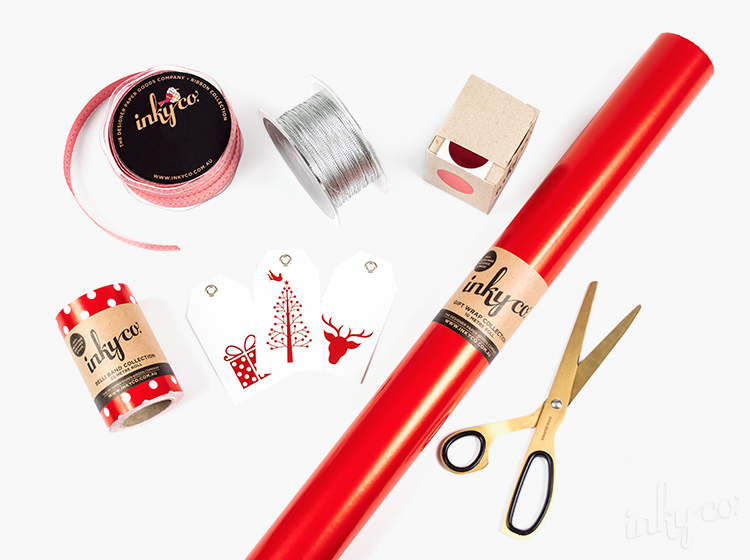 Step 1: Wrap your gift using your chosen roll wrap and double-sided tape. 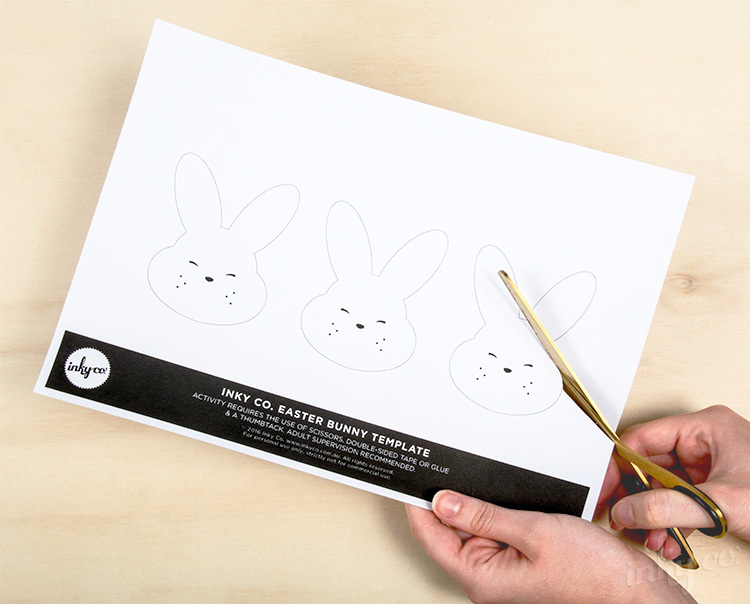 Step 2: Cut out your bunny from the printed card. Step 3: Using your thumbtack pierce holes where the whisker holes are. 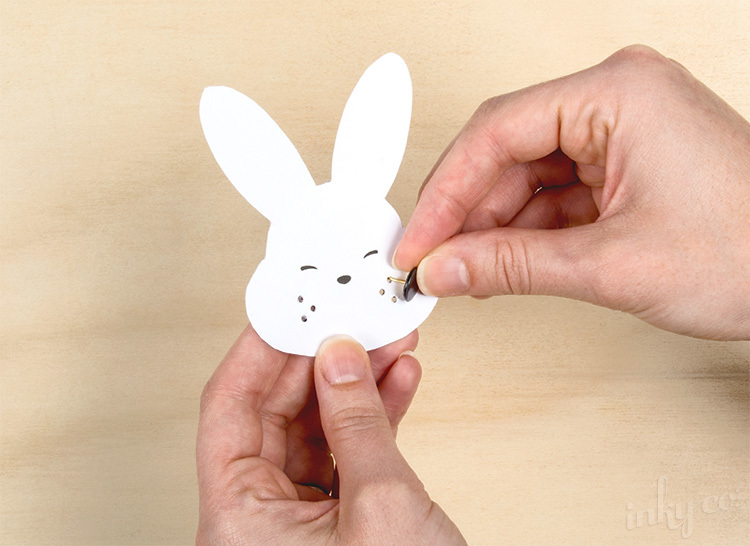 Wiggle the thumbtack around to widen the holes if necessary. Step 4. Thread the Metallic Cord through the bottom right hole leaving enough cord to tie it at the back later. Step 5. 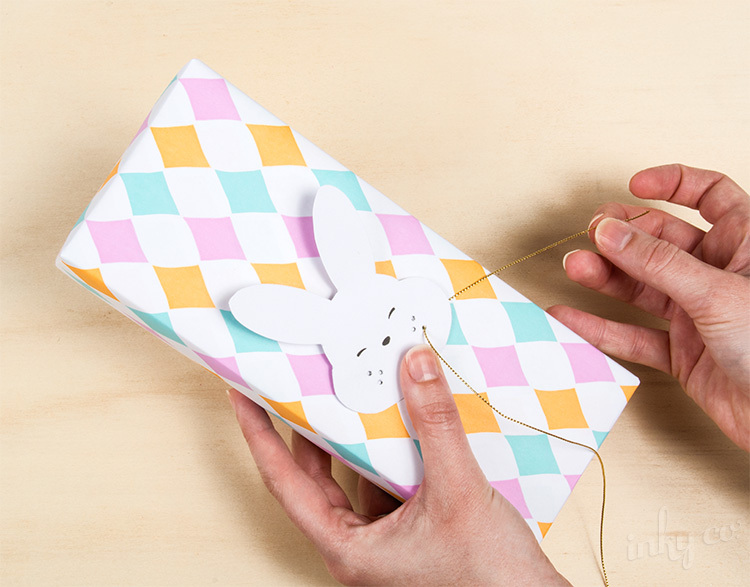 Wrap the cord around the back of your gift, threading it through the holes on alternating sides. Repeat this until all the whiskers are done and you have the end of the cord at the back of the gift. Step 7. You're done! All ready for when the Easter Bunny arrives. 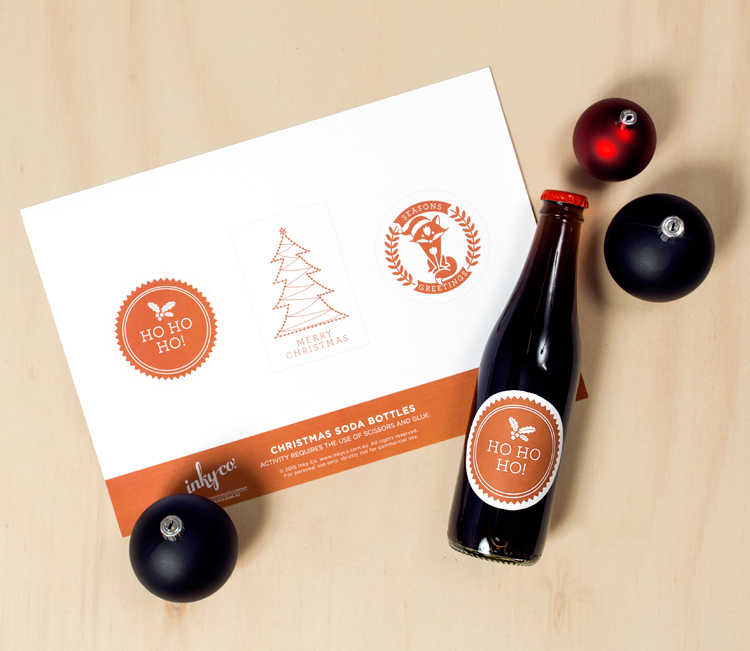 Because an Australia summer isn't always conducive to mulled wine and eggnog, we've designed these cute Christmas labels to jazz up your favourite fizzy soda! 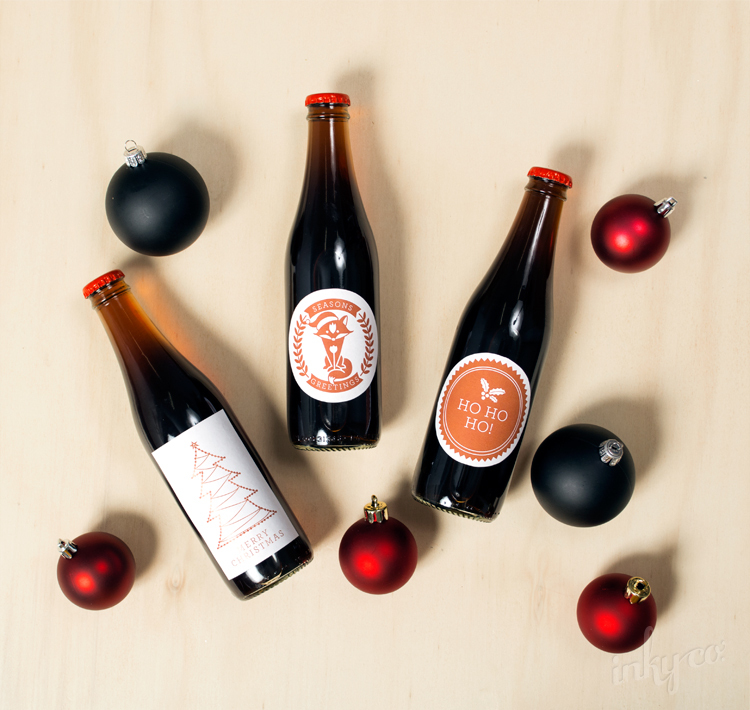 Matching our uber popular Fairy Lights Copper, these fizzy festive bottles are crazy easy to create. 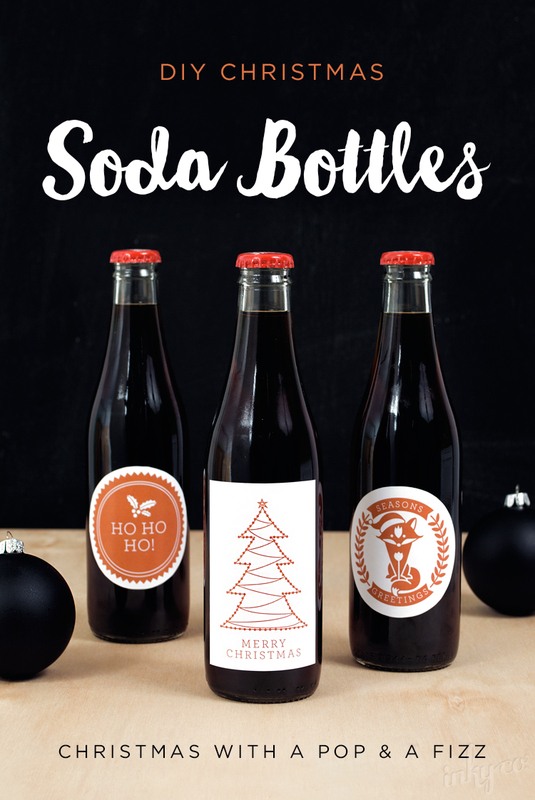 The key is picking the cutest bottle you can find, soak off the label and download our Xmas Soda Bottle printable here. Cut around the outline of each label then use a glue stick to attach it to the glass. 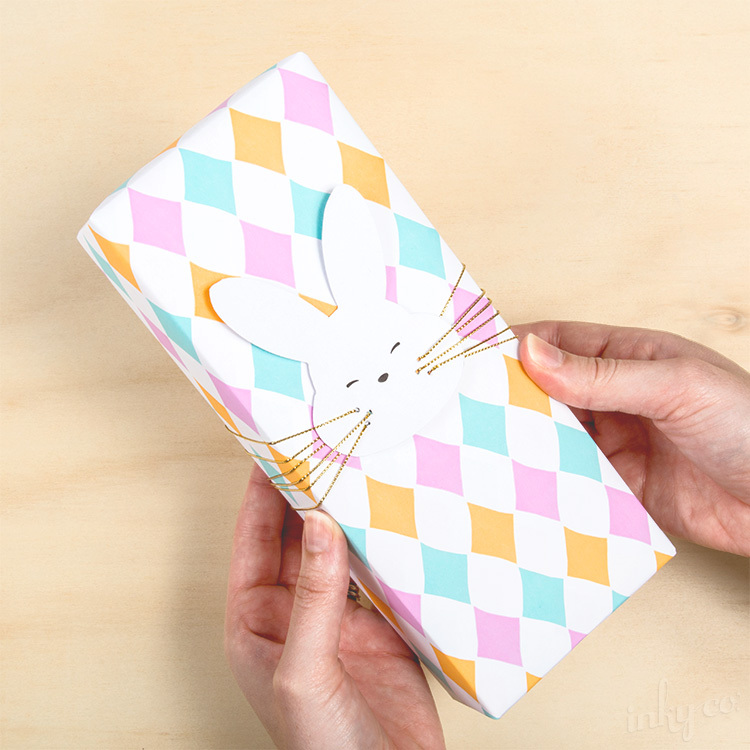 It's simple and oh so cute! Cheers! 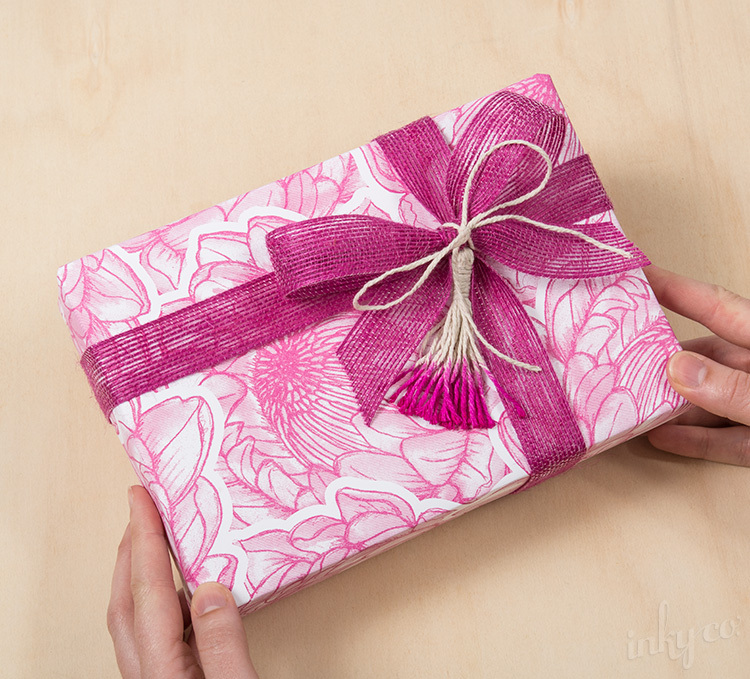 The best way to get your gift wrapping skills up to pro-level is to start with the basics. 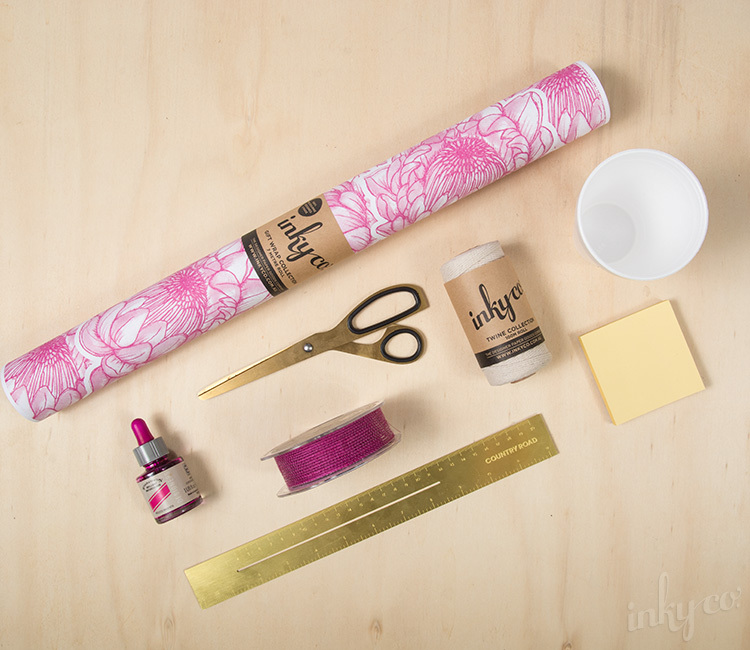 In this tutorial we will show you a few simple ways to adorn your wrapped with with embellishments. 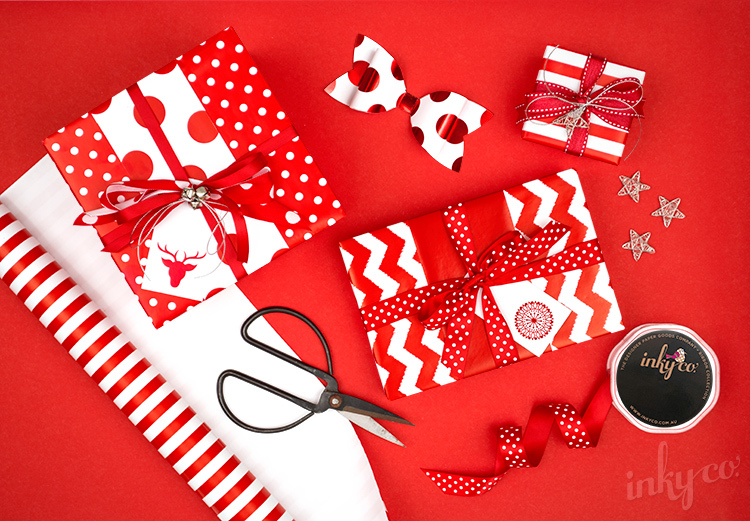 This helps your present to stand out from the pack, because half the fun of gifts is unwrapping them! Step 1. 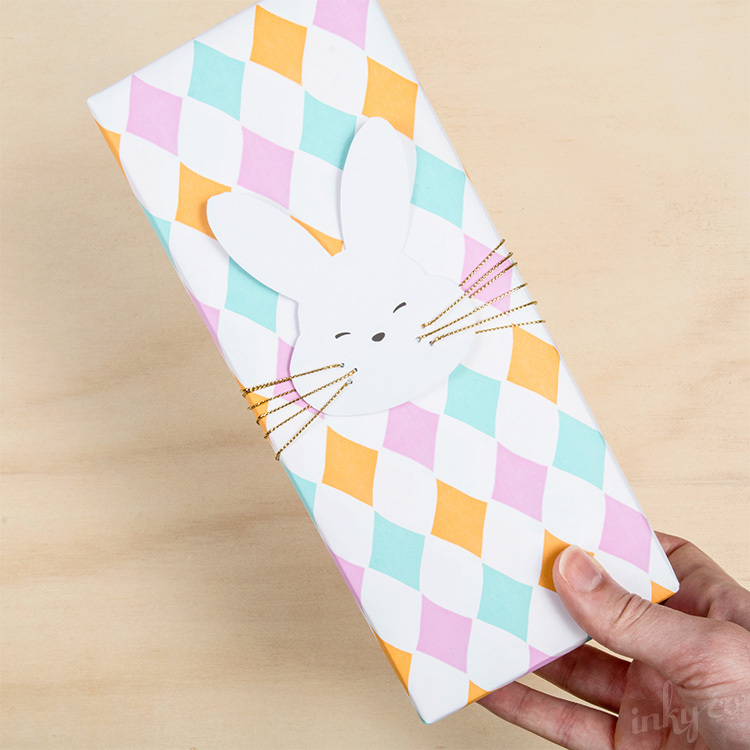 Wrap your gift in your chosen wrapping paper. 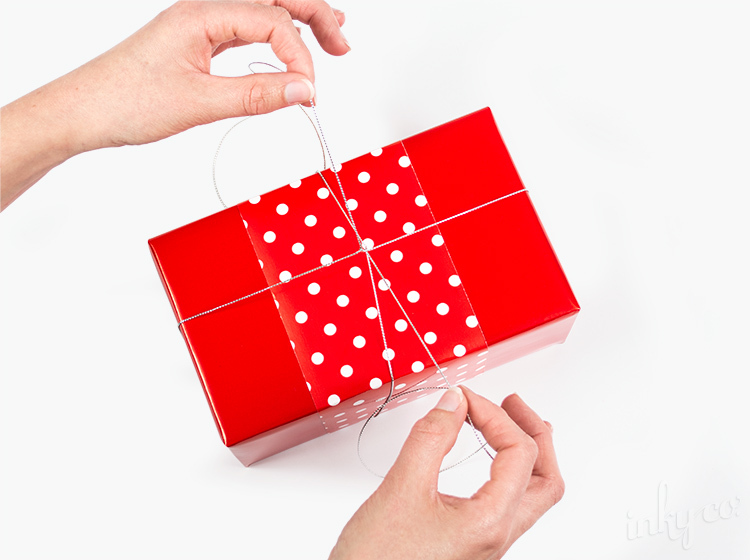 Tip: where possible we transfer awkward shaped objects into a gift box before wrapping. 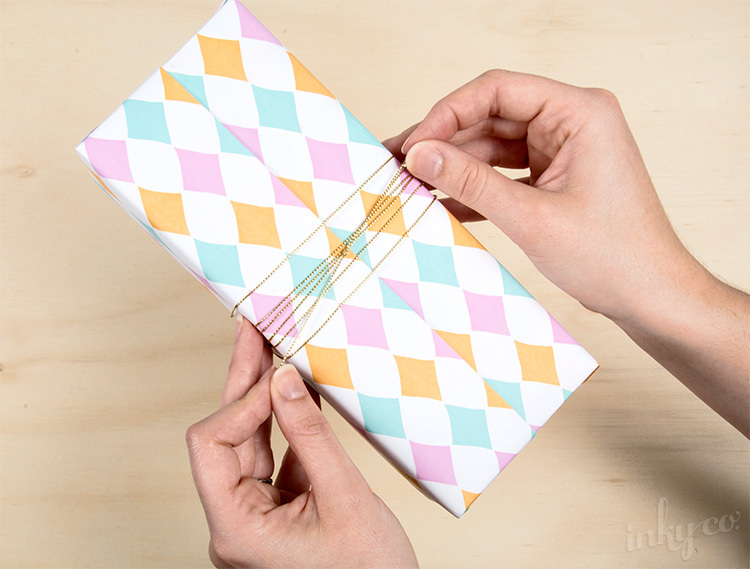 This gives you nice need corners on your gift and makes wrapping it much easier. Step 2. 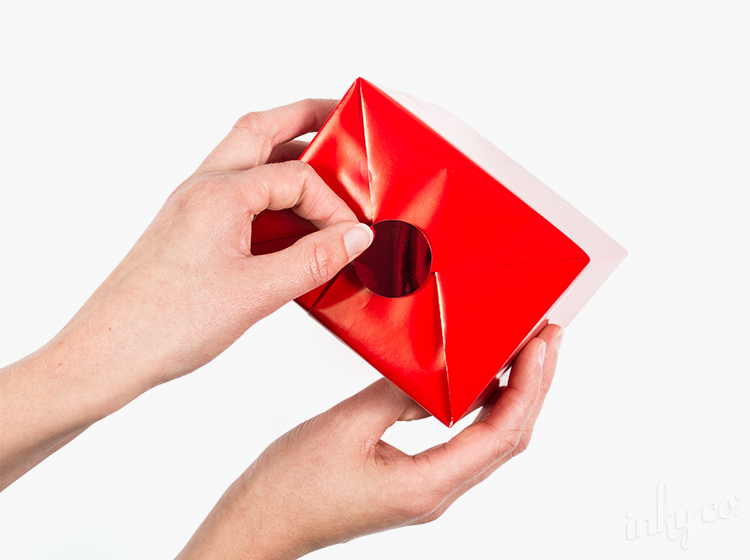 Secure down the folded ends with a plain gift seal. Step 3. Add a Belli Band! Belli Bands are great for creating contrast using colours and patterns. Step 4. 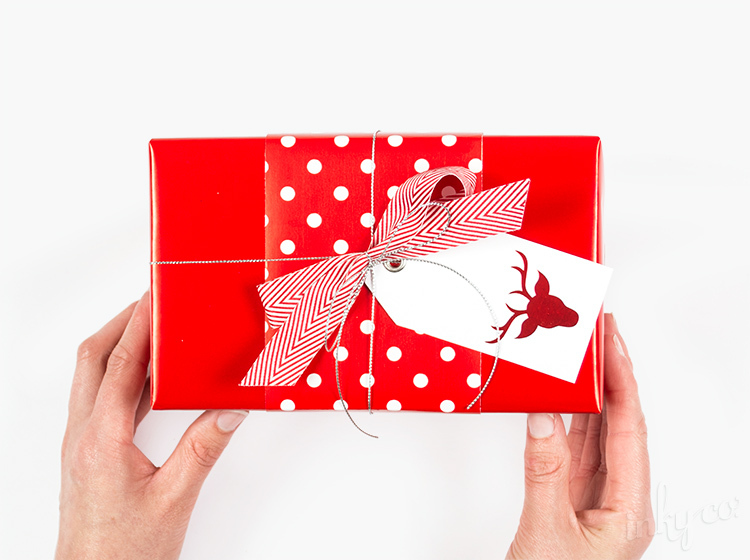 Tie your metallic cord or twisted twine around your gift bringing the loose ends together at the top. Don't tie them into a complete knot just yet. Step 5. 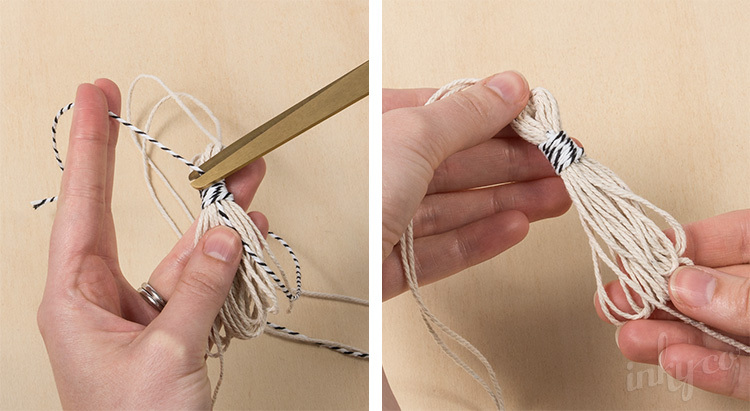 Create a 'figure of 8' loop out of your second ribbon with the cut ends facing outwards. Make sure the ends are the same length. Step 6. 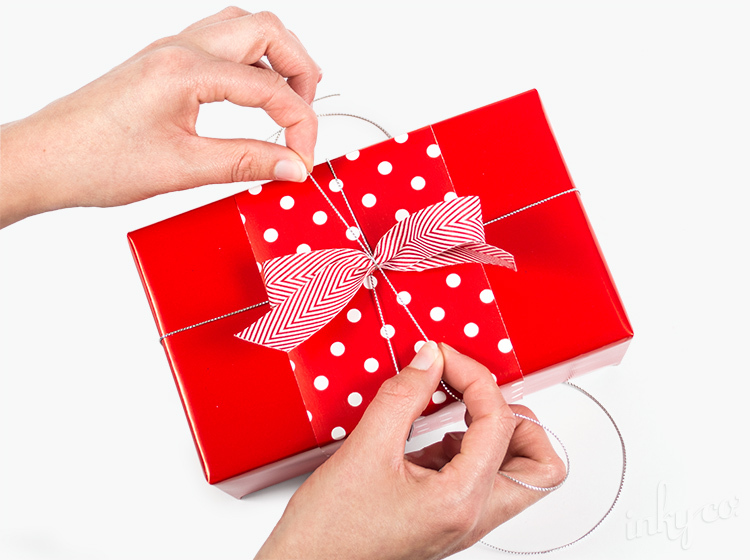 Using your cord/twine, tie it around the middle of your ribbon loop to create a 'faux bow' on the top of your gift. Step 7. 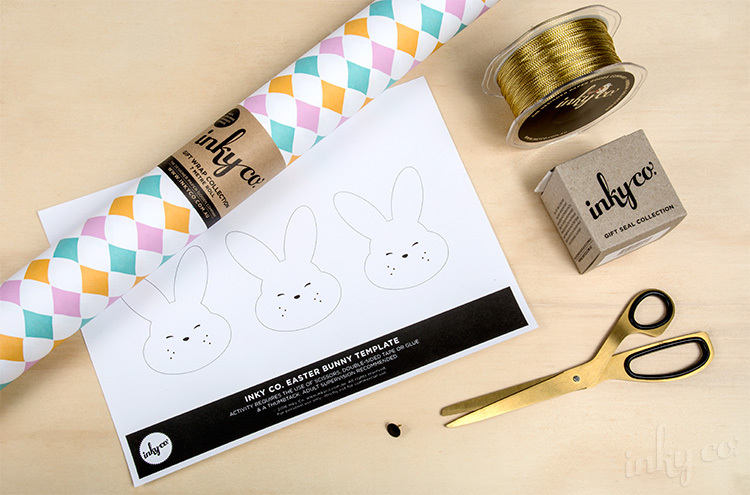 Write your note on your gift tag and secure it to your gift using cord or a mini peg. 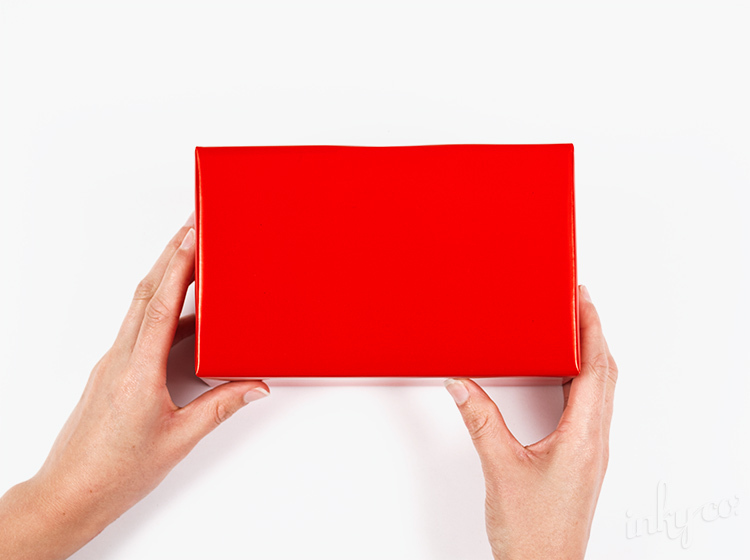 Give your snazzy looking gift to your loved one!